Observation - Whose home is this? - UK and Ireland. Description: Could this, by any chance, be the entrance to an otter holt? 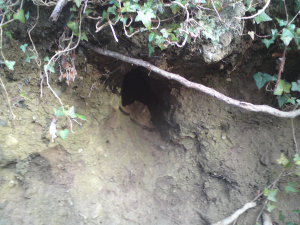 Hole found in a bank, opposite the Glencullen river in Knocksink Wood, nr Enniskerry co. Dublin. It looks as if there is evidence of footprints but none clearly visible. Could this, by any chance, be the entrance to an otter holt? Hole found in a bank, opposite the Glencullen river in Knocksink Wood, nr Enniskerry co. Dublin. It looks as if there is evidence of footprints but none clearly visible.